The four recordings we have here were set down in Vienna between 1936 and 1938. 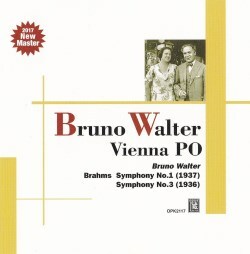 Prior to Hitler's accession to power in 1933, Bruno Walter (1876-1962) had centred his career in Munich and Leipzig. All this was to change. The Nazis’ anti-semitic policies forced the conductor, a Jew, to flee to Austria. He spent the next few years in Vienna as artistic director of the Vienna State Opera and frequently conducted the orchestra, under its concert hall title Vienna Philharmonic. He stayed there until 1938, when he was uprooted once again, moving to France and from there to America, where he spent the rest of his life. These years in Vienna were very productive and he made a number of recordings for Columbia. I have already reviewed Walter's Mozart recordings from this period. 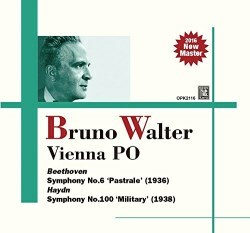 Walter set down three commercial recordings of Beethoven's Pastoral Symphony, of which this is the earliest. Although famed for his relaxed benevolence towards the orchestral players, this certainly doesn't translate into this performance, which eschews over-indulgence and is devoid of sentimentality. It's an invigorating reading, rhythmically pliant, with an acute sense of purpose. The music is never allowed to sag. The orchestra are on top form, and Walter's shaping of the woodwind passages adds colour and lustre to the restricted 1930’s sound. I must single out the Allegretto finale, which sings out with beguiling lyricism. The opening movement of Haydn's Symphony No. 100 Military is heavy laden, and disappoints. It all seems too self conscious. I prefer the more lithe, animated approach of Colin Davis and the Concertgebouw. The other three movements do fare better. The finale is particularly uplifting; affable, good-humoured and oozing geniality, the rhythmic vitality is alluring and seductive. The impressive Musikvereinsaal was the chosen venue for the recording of the two Brahms Symphonies, and the marvellous, rich acoustic reaps rewards, conferring a warm, glowing halo around the sound. The epic grandeur of the First Symphony is compelling. The opening movement is vital and dynamic, and Walter’s adept handling of the climaxes is impressive on all counts. The autumnal glow of the Andante sostenuto is endearing, with the violin solo near the end satisfyingly balanced in the mix. The third movement is strikingly buoyant, with a palpable feel of geniality and contentment. The introduction to the finale conveys a sufficient level of anticipation. Walter contours the ebb and flow of the finale with true mastery, and the 'big tune' has nobility and grandeur. The exultant coda is a fitting end to an exhilarating performance. The conductor draws forth sufficient dramatic energy in the outer movements of the Third Symphony. In the first movement he achieves that heroic quality, sadly missing in some performances I've heard. The slow movement is lovingly phrased and ardently rendered, whilst the Poco allegretto doesn't linger, and its more urgent pace pays dividends. The transfers have been sourced from Japanese Columbias, except for Brahms Symphony No. 3 where UK HMVs have been used. Opus Kura's non-interventionist transfers mean that there is 78 surface noise audible throughout, but it is in no way intrusive. In fact the sound is remarkably clean and consistent in all four recordings, allowing the sheer potency and commitment of the playing to shine forth. Booklet notes are in Japanese and English.